UK Pakistan Chamber of Commerce and Industry (UKPCCI) - ukpcci.net - has shown interest in making investment in PIA. In this regard, a seven-member delegation of UKPCCI led by Waheed ur Rehman Mian visited by PIA head office in Karachi and met with airline's CEO Air Marshal Arshad Malik. In the first phase, UKPCCI offered an aircraft to PIA and buying shares in the airline. Arrangement of more aircraft for the airline has been offered in the second phase by the chamber. UKPCCI delegation members said that PIA is a national asset and Pakistanis prefer PIA for air travel from UK to Pakistan. Karachi, April 12, 2019: UK Pakistan Chamber of Commerce & Industry has offered PIA an aircraft for flights to UK. The offer was made by the UKPCCI’s Board of Directors during a meeting with PIA CEO Air Marshal Arshad Malik and PIA Senior officials at the airline’s Head Office. The delegation of UK Pakistan Chamber of Commerce and Industry was led by General Secretary UKPCCI Waheed Ur Rehman. Mr. Waheed said that in line with the vision of Prime Minister of Pakistan to promote tourism and the concept of Naya Pakistan, the UK Chamber is keen to invest by way of providing an aircraft to PIA, the funds would be generated by the UKPCCI itself. The selection of aircraft will be decided very soon. The UKPCCI delegation included Syed Siraj Ahmed, Mrs. Nawab Siraj, Mr. Gulzar Khan and Mr. Hassan Ashraf. 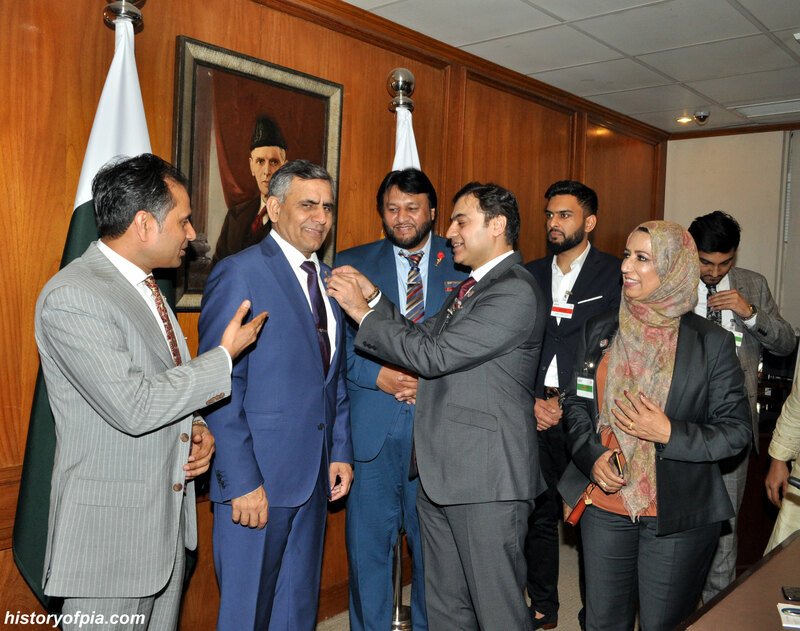 Air Marshal Arshad Malik while appreciating the gesture of the UK Chamber said that the airline welcomes the initiatives of overseas Pakistani investors to strengthen the national flag carrier and to promote tourism in Pakistan. He said that PIA will provide feasibility and expertise to the UK Chamber for selection of aircraft and aircraft utilization. He assured them of full cooperation to materialize the acquisition of aircraft and its utilization to provide convenience and comfort to Pakistanis living in UK. Later Chief Commercial Officer PIA Ali Tahir Qasim and General Manager Brand Aamir Memon briefed the delegation about the airline business prospects of Pakistan-UK market. A committee comprising of officials from PIA and UK Pakistan Chamber of Commerce and Industry will be formed to discuss the modalities of the operation. LAHORE: The UK-Pakistan Chamber of Commerce and Industry (UKPCCI) on Sunday announced to invest £200m in Pakistan under which it would operate an aircraft of the Pakistan International Airlines (PIA) under the public-private partnership. It would invest £140m in the government’s Naya Pakistan Housing Project and other segments of real estate while paying attention to the textile sector also. The announcement was made by UKPCCI President Amjad Khan and Secretary Mian Wahidur Rehman at a news conference at the Lahore Press Club on Sunday. They said the selected areas for investment, included the PIA, housing, education and health, tourist destinations in Gilgit-Baltistan and Khyber Pakhtunkhwa, halal food restaurants chain, a food processing plant in Malir, Karachi, and Sialkot’s surgical and sports goods. They said the chamber’s director, Syed Siraj Ahmad, would provide free-of-cost software to improve the PIA management. Under the initial negotiations, the administrative matters of the PIA plane, which the chamber wanted to operate, would rest with it and the PIA would handle its operations.